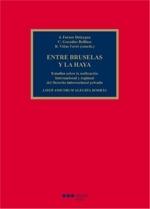 On the occasion of the retirement of Prof. Alegría Borrás a collective book entitled “Entre Bruselas y La Haya. Estudios sobre la unificación internacional y regional del Derecho internacional privado. Liber Amicorum Alegría Borrás” has been published by Marcial Pons . The project, coordinated by Joaquin Forner Delaygua, Cristina González i Beilfuss and Ramon Viñas, gathers more than thirty contributions in English, French and Spanish, by well known and reputed authors of many different nationalities. A huge book, not to miss, that matches the impressive task developed over the years by this Ambassador of Spanish Private International Law in Europe. (Click here to browse the index and for a glimpse of the first chapter).